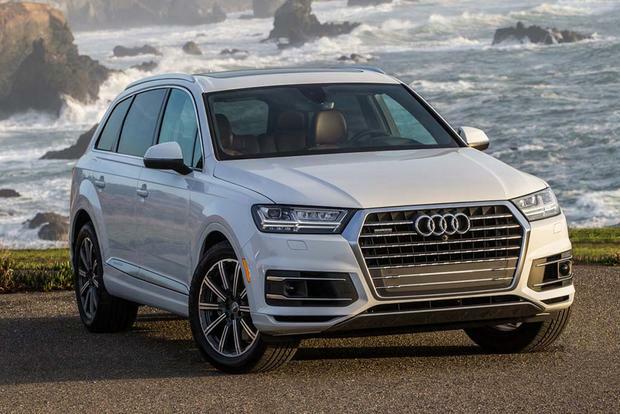 The 2019 Audi Q7 has all the right elements to be a stellar choice among 7-seater premium SUV/crossovers. 2018 Acura MDX vs. 2018 Audi Q7: Which Is Better? These luxury crossovers are direct competitors with different value propositions. 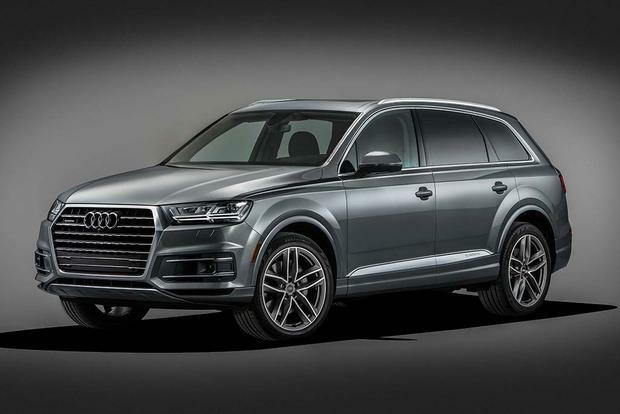 Audi has officially joined the \"cool SUV\" trend. 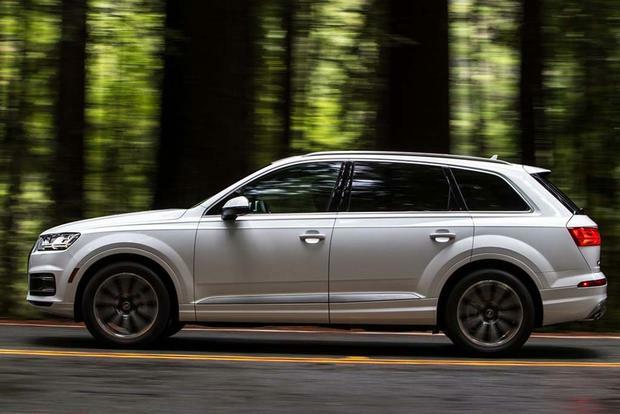 We consider the 2018 Audi Q7 to be one of the best SUVs. A killer combination of luxury, versatility, driving talent and accomplished execution puts it front and center of its class. As plush as a luxury sedan inside, the Q7 offers plenty of up-to-the-minute technology features, such as Side Exit Assist (which keeps a virtual eye out for the approach of other road users when an occupant goes to open the Q7's doors) and even a thundering 23-speaker sound system. As well as providing optimum comfort, the optional adaptive air suspension can raise the ride height if this all-wheel-drive vehicle is ever in a situation where it needs more ground clearance, or can lower it for superior aerodynamics at freeway speeds. The Q7 is a must-drive contender in its class. It's a premium SUV that turns the notion of a 7-seater family vehicle into something extremely desirable. 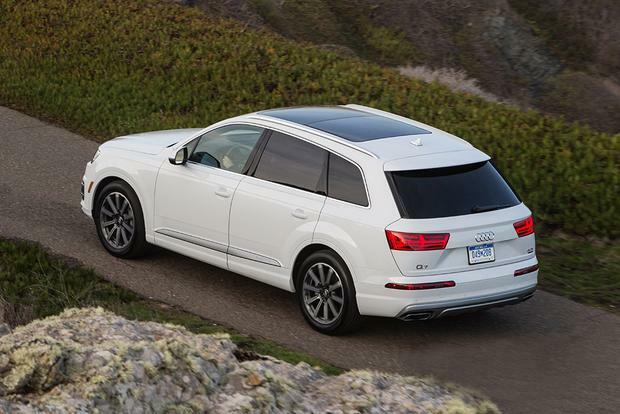 The Q7 range starts out with a turbocharged 2.0-liter 4-cylinder engine developing 252 horsepower and 273 lb-ft of torque. It drives all four wheels through an 8-speed automatic transmission. The Environmental Protection Agency (EPA) estimates fuel consumption at 19 miles per gallon city, 25 mpg highway and 21 mpg combined. The optional engine is a supercharged (despite the 3.0T badge that suggests a turbo) 3.0-liter V6 generating 333 hp and 325 lb-ft of torque. This is also linked to an 8-speed automatic transmission and an all-wheel drive system. The EPA puts fuel consumption the same as the 4-cylinder unit: 19 mpg city/25 mpg hwy/21 mpg combined. 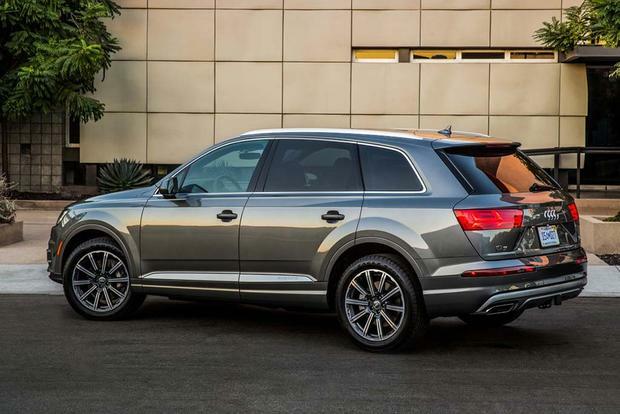 The 2018 Audi Q7 comes in Premium, Premium Plus and Prestige trim levels. Premium ($50,875) has 18-inch alloy wheels or (19-in alloys in the 3.0T), panoramic sunroof, keyless entry/ignition, power tailgate, roof rails, xenon plus headlights with automatic high beams, push-button start, heated/power-folding side mirrors, LED daytime running lights and taillights, rain-sensing wipers, tilt/telescope steering wheel, forward-collision mitigation with pedestrian detection, drive modes (including an "Offroad" setting), tri-zone automatic climate control, ambient LED cabin lighting, leather seating surfaces, heated/8-way power-adjustable front seats (with 4-way lumbar adjustment on the driver's side, along with memory settings), rearview camera, parking sensors front and rear, six cup holders, 4 bottle holders, Bluetooth, 10-speaker audio system, 7-in display, HD/satellite radio, two USB ports and an SD card slot. This trim level is eligible for an options package that brings navigation (with the ability to be controlled by voice or handwritten inputs), Wi-Fi, and AppleCarPlay/Android Auto smartphone integration. Premium Plus ($54,875) incorporates those options and adds power adjustment for the steering column, hands-free tailgate operation, self-dimming side mirrors, blind spot monitoring and side exit alerts. Options for this trim level include full LED headlights, the Virtual Cockpit configurable information display, quad-zone automatic climate control, ventilated front seats, a top-view camera system and a 19-speaker/558-watt Bose "3D" sound system. Prestige ($66,375) comes only as a 3.0T model. It has the equipment from the Premium Plus model, including those optional features, plus 20-in alloy wheels, a head-up display and an 8.3-in center screen. The Prestige trim may also be equipped with a bundle that pairs an adaptive air suspension with rear-wheel steering. Other extras for this trim level include a 1,920-watt Bang & Olufsen audio system with 23 speakers, night vision with pedestrian/large animal detection, multi-contoured/massaging front seats, power-closing doors and upgraded leather upholstery with a simulated suede headliner. Premium Plus and Prestige models are both eligible for a features bundle that includes adaptive cruise control with upgraded forward-collision mitigation, lane-keeping assistance and road sign recognition (Driver Assistance package). All models may be ordered with a towing package, rear seat entertainment system and heated steering wheel/heated rear seats. Behind the third row of seats is 14.8 cu ft. of cargo space. Behind the second row is 37.5 cu ft. With both rows folded down, maximum volume is 71.6 cu ft. That's better than the BMW X5. As well as the mandatory safety equipment (anti-lock brakes, traction control, airbags, etc.) 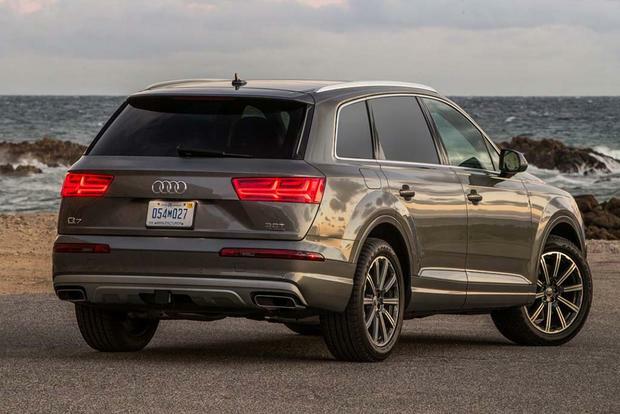 the Q7 also comes standard with forward-collision mitigation with pedestrian detection. Side airbags for the rear seats are optional. The National Highway Traffic Safety Administration (NHTSA) has awarded the Q7 a maximum score of five stars overall. 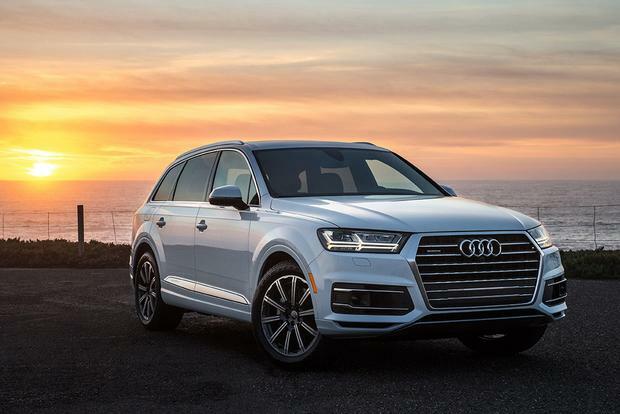 The Insurance Institute for Highway Safety (IIHS) named the Q7 a Top Safety Pick after scoring top marks in most categories, except for the headlight test. Although they're optional, the adaptive air suspension and rear wheel steering features really do make a difference, providing superb comfort and body control, with an uncanny agility for such a large vehicle. In any conditions, the cabin is quiet and comfortable, with that high-quality/high-tech feel so typical of Audi products. There's plenty of occupant space in the first two rows, but the power-folding third row is still a little cramped for adults of average size or above. From a cargo standpoint, the second-row seats fold in 35/30/35 fashion, while the third row splits 50/50. The 2.0T is capable of towing 4,400 pounds, and the 3.0T can pull 7,700 pounds. 2018 Acura MDX -- A great cost/equipment proposition with a comfortable ride quality. 2018 BMW X5 -- Seemingly capable of everything required from a premium crossover, including keeping a driver involved. 2018 Volvo XC90 -- Handsome in its own way, luxurious and spacious. Used Mercedes-Benz GL-Class -- The super-capable GL (now renamed the GLS) has an adult-sized third row. A new GLS, however, is more expensive than the Q7. So consider a certified pre-owned (CPO) GL, especially if space is a priority. Most people should be more than satisfied with the Premium Plus trim, since it comes with a useful amount of equipment. When perusing the options list, select as many safety features as possible. If there's money left over, get the V6.